I think many would agree that the Baskin Robbins brand needs a little facelift. Their current logo highlights their classic 31 flavors, which today doesn’t seem all that special, since many local ice cream shops have just as many if not more! So what does make Baskin Robbins different? Well they do have a rich history dating back to 1945, and they also have a special pink spoon pledge. This pledge was created because they believe their customers should be able to sample any of their flavors for free. For their new logo I combined these two elements into this fresh, vintage inspired logo. To show off the company's new rebrand, I created an advertising campaign. After a competitive analysis, I noticed that Millennials were rarely targeted in ice cream advertising, even though 95% of Millennials were eating ice cream! I saw an opportunity here to tap into this market by positioning ice cream as a reward - and we all know that millennials love to be rewarded! I turned the pink spoon into the reward Millennials are able to earn by “adulting”. Make yourself a real dinner – pink spoon for you! 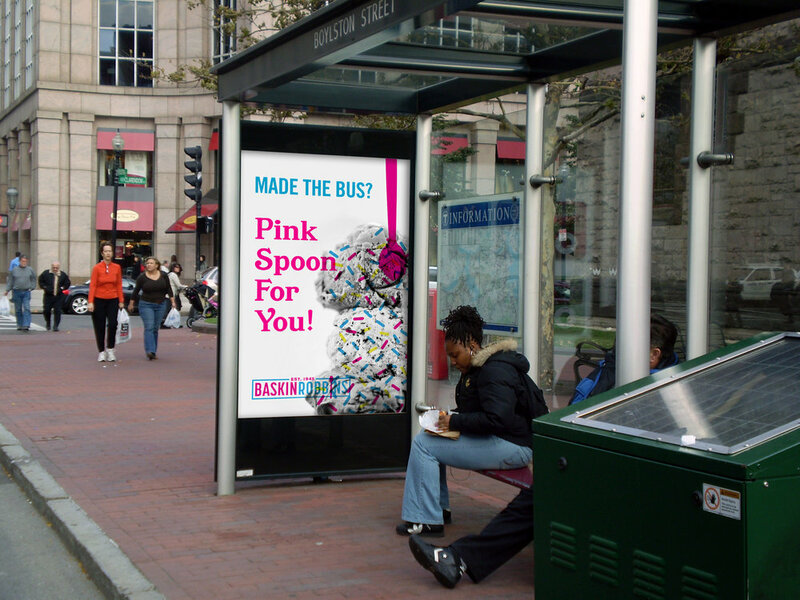 Pay your bills – pink spoon for you! The objective was to remind Millennials of the fun they had at Baskin-Robbins.